In our history of popular music, an Electric Guitar is an instrument that is still very much in infancy comparing to piano or brass and horn instruments. During Jazz’s early days, banjo was much more popular not only because it’s more easily obtainable but the sound was loud enough to cut through the brass section of an early New Orleans Jazz bands. So, that’s one of the reasons why you won’t find a guitar playing with a marching band in New Orleans. Only at the beginning of the swing era craze in the 1930s, the guitar expands its endeavour to popularity as a part of the main rhythm section. Used primarily to thicken up the sound of a rhythm section on orchestras and Jazz big band, its main function was a comping instrument that commonly accentuates the quarter notes along with the double bass’ walking bass line. Hence we came upon the boom-chick rhythm term. That’s when you get a bass player to play notes (“boom”) on beats 1 and 3 and (“chick”) is the sound of the rhythm guitarist emphasising on beats 2 and 4. When Swing era reaches its pinnacle in the 30’s, bigger venues were needed to accommodate those lindyhoppers and teenyboppers. So when the band format got larger, the guitarist needs extra volume to match the rest of the band. An electric guitar with amplification is an indispensable solution. When Les Paul created the first electric guitar in 1931 that appears literally like a frying pan, the world wasn’t ready for a soloing guitarist. But the next advancement which came in science of amplification and microphones came to change the function of anelectric guitar for good. That guitar players can do single note improvisation in a jazz band – just like a horn instruments would do, without worrying if the sound will be drowned out by other instruments. 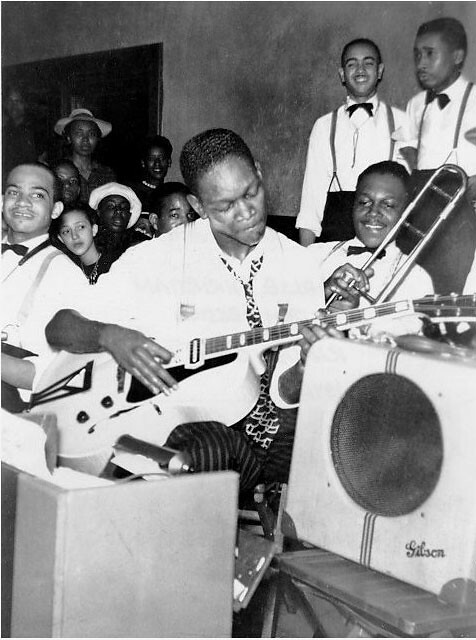 Guitarist Eddie Lang and Lonnie Johnson had contributed a lot during the electric guitar’s transformation from a rhythm section instruments into a soloing instrument. But a young man called Charlie Christian who was the foremost essential figure in the history of Jazz guitar. His style was indistinguishable since the maestro would include a flowing legato notes in his improvisation just like a horn or a trumpet player would play. And fromcutting edge guitarists just like him, and Grant Green, Danny Barker and Django Reinhardt that incorporate language dictionary of Bebop improvisation, the guitar began to be seen as a Jazz instrument. Until their contemporaries such as Joe Pass, Wes Montgomery, Tal Farlow, Kenny Burrel had layed the ground work of what we know now as a Jazz Guitar Style. In popular music such as Pop and Rock, guitarists tend to play in a more rhythmical fashionand play sharp riffs that strongly characterise a song, especially in rock music. Occasionally guitar playing were divided into two “roles”, a rhythm guitarist who handle the song’s harmonic progressions and a lead guitarist who play all the riffs and solos. But in most times these two roles do not apply in Jazz Guitar style. In those early days of electric guitar, Jazz guitarists like Danny Barker or Freddie Green from Count Basie band frequently plays a constant quarter notes strumming to ”push” the horn and brass section. This is a solid team work with the rhythm section members, especially bass player and the drummer to create an intense and tight swinging rhythm. In modern Jazz guitar style, chords are being played more sparsely and at times resemble a horn section of a Big band. Chord voicings or inversions are frequently more complex, since it should be able to accommodate more complex melodic structure in modern Jazz tunes. On top of that, to properly accompany a soloist on a Jazz tune require some hearing expertise. Because in short words, in order tocompliment a solo which “tell a story” we can say that the accompanist improvise along with him. In the Jazz guitar style, guitarist often adopts a legato style of playing with natural breathing like horn players (saxophone, trumpet, etc). Horn players need to take a short breath between musical phrases, and these pauses are identically with traditional Jazz phrases. Needless to say, guitarists also must be able to play rhythmical grouping variations and appropriate dynamics. 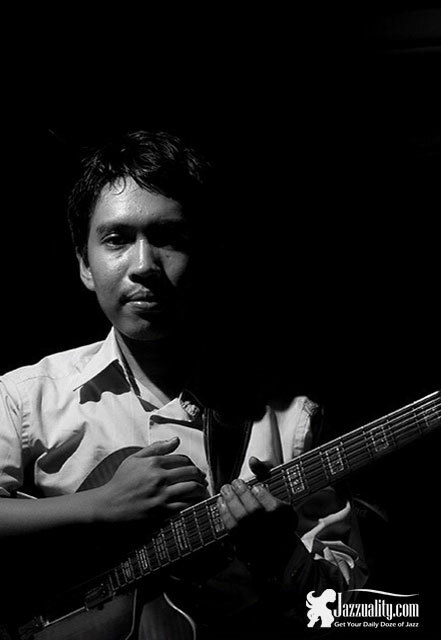 Facilities and tools use in Jazz guitar improvisation like passing notes, guide tones of chord progressions and various scales, and their relation with harmonic structures are crucial. 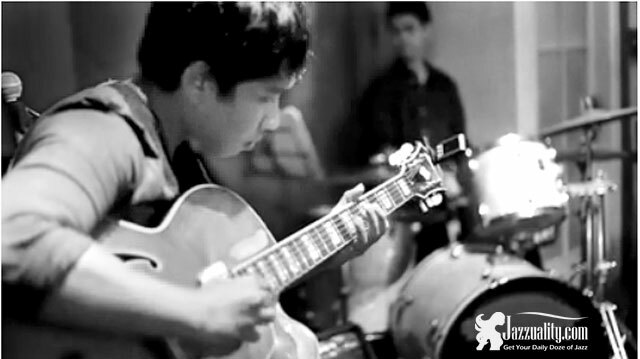 Some Jazz guitarists would take pride in making chord solos, which done by adding melody on top note of a chord voicing. So to improvise, you need to be able to integrate the basic building blocks of harmonic structures and to understand their connections with the melody and forms, so that you can (intuitively) choose which notes to play. And then you fit them into a well balanced contour, both melodically and rhythmically musical phrases, while keeping the tempo and swinging with the band. Oh, and do not forget the foremost important thing in playing together, that is listening to your band mates doing those things too. Sounds difficult? Well then I have some bad news; there are no shortcuts in learning music and improvisation. In our world, very few people, perhaps only less than 5% of musicians that able to improvise well on bebop and modern jazz harmonies with an elaborate harmonic structure, without sufficient knowledge of music theories. But the good news is that most of us are the 95% remaining. Who knows, it may also include your Jazz guitar idol that had spent tens of thousands of hours of practice to be able to reach that professional level. In short, Jazz improvisation is almost like talking to somebody. To communicate with someone you need to be able to express your thoughts (song) at a person (the listener). For one can understand (enjoy), you must express your words clearly (articulation and phrases), with the right tone of your voice (tempo and dynamics). Not too slow, too loud or too fast and stay within the context of your subject. You need to be able to choose your words properly (proper selections of notes) and know exactly what you are talking about (harmony and their relationship with the melody). Sentences that are efficient in length and uncomplicated will sound much better (not playing too many notes that are inaccurate). Complete each of your sentences clearly and.. don’t forget to listen, so that you can react appropriately. Rhythm, melody and solos can be interpreted more freely in Jazz. Each musician can give musical ideas and others can react appropriately to that idea. Both melodies and soloscontain musical informations, and rhythm sections mightusually “follow” the subject. (Although sometimes can be interesting if we can change a bit the course of the subject). Trust between players is important, because you need to feel comfortable with the groove and the overall feel of the song that you play, to reach your goal which is to communicate your art to your audience. Listening is the first rule in playing together with the band. So don’t just listen to yourself, but for example try to listen and notice how your bass player is trying to build solid harmonic structure in his walking bass to support the melody, or solo you are playing, or you should try to listen what type of inversion your piano player have on his left hand and what kind of musical idea that he might have which could influence you in choosing the next phrase, or pay attention to your drummer, maybe he was playing some very inspiring rhythmical ideas. Listening is also a way to identify musical problems so you can quickly find a solution to them. If you are not aware of these things around you when playing Jazz, you will miss important moments in music. There are maybe 4 to 5 people in a Jazz ensemble so ideas are already there for you to grab, often it is much better to play music that is “there” than the music that’s already fixated “in your head”. And leave your ego at home because the ensemble playing is a collective activity, when musicians with various instruments have merged into a single unit of what we call music. Note the position and the volume of your band mates. On a big stage, if only necessary, slightly adjust your monitor speakers (never adjust your monitors to loud because it will cause discomfort and feedback, especially if you use a hollow body guitar). This applies equally to point 2. Adjust the volume balance and instrument’s EQ to blend the overall sound. (It is often a task of a sound engineer but remember it is your art at stake, so you should have a bit concern for this). It is important to be able to communicate and have eye contacts with your band when playing. So consider the position where you will be playing, and search for an ideal position where your ears can hear the overall sound adequately.